If you’re looking for a picturesque and exceptional location for your short-term rehabilitation or long-term care needs, Forest Ridge Senior Living will exceed your highest expectations. 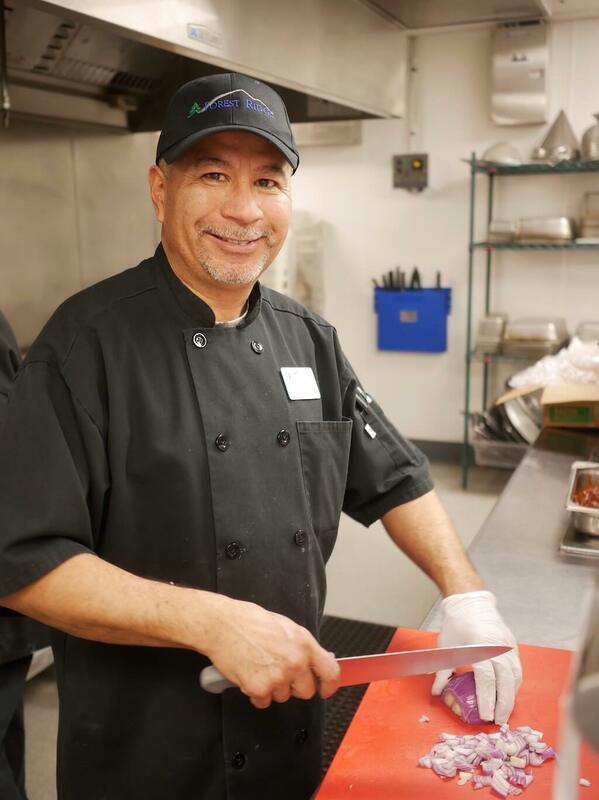 We have highly-skilled and seasoned chefs on staff, meaning every meal you enjoy during your stay with us will be healthy and delicious. 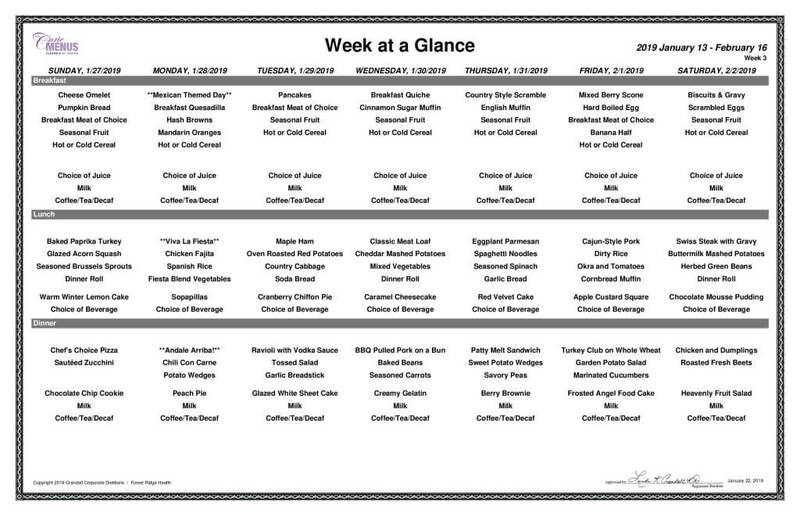 Call 719-686-6500 and ask us for more information on the entrees and outstanding meal choices you’ll be enjoying when you trust Forest Ridge Senior Living with your recovery and care, or check in with us here for our updated weekly menu. 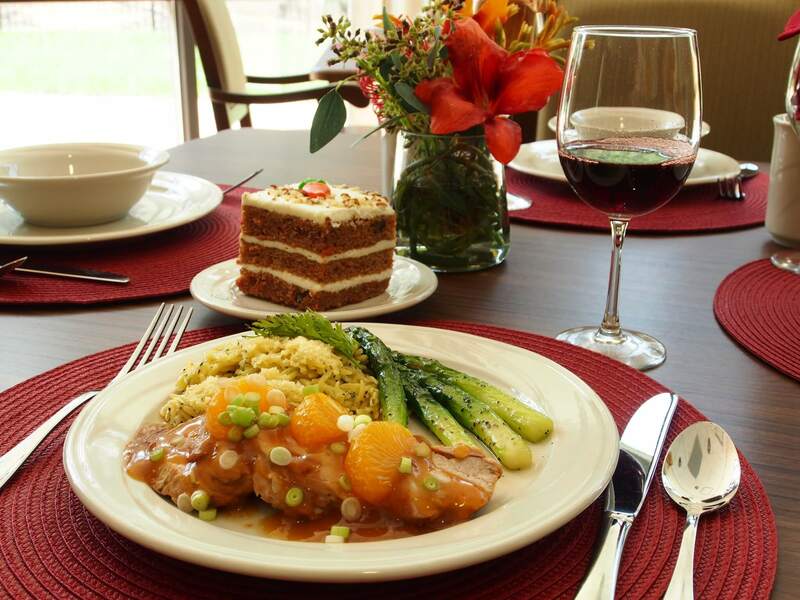 Intimate dining rooms w/meal service in each neighborhood. All beef patty on bun with American, lettuce, tomato, onion, & pickle. Smoked sliced ham & Swiss on wheat with lettuce, tomato, onion, & pickle on side. Fresh sliced tomatoes on green lettuce leaf with crispy bacon on white. The true comfort-food classic of American cheese melted inside buttered white cooked to perfection. Hand- sliced bologna with American cheese on white. Whole baked potato loaded with sour cream, shredded cheese, bacon, and chives. Cottage Cheese with pineapple, Garden Salad, Lay’s Potato Chip’s, Potato Fries, & Soup (Campbell’s Chicken Noodle or Creamy Tomato).